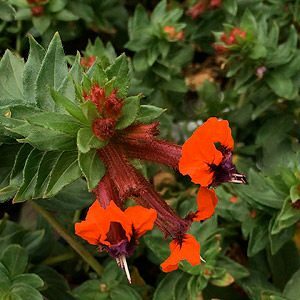 With over 200 species, Cuphea vary in growth habit and flower form. Three of the most commonly grown species are Cuphea hyssopifolia commonly grown as a small shrub, Cuphea mexicana is commonly called Mexican Heather or Elfin Plant. Cuphea llavea is the species referred to as ‘Little Mice’ or ‘Bat Faced Cuphea’. Most species are fairly low growing, and all seem to grow well in warm climates. C. hyssopifolia will reach around 50 cm in height, evergreen and long flowering.Flower colour varies from purples to white.Easily pruned to shape and size. C. mexicana will reach around 40 cm in height and is mainly grown in a the compact form. Again flowers are mauve or white. C. llavea is the species with the colourful flowers,orange, red purple and white. The flowers are said to resemble mouse ears or a bat face. It is low growing to around 4o cms, evergreen and particularly showy, especially the red and purple flowering variety. Excellent in the garden, containers or a hanging basket. All species prefer a sunny position, with just a little afternoon shade. They do not perform well in deep shade. A humus rich well drained soil is ideal. Mulch around the plants to retain moisture, limit weeds and maintain a cool root run. Fertilise with a general purpose slow release type fertiliser in spring. Provide some extra water during long dry periods. Cuphea are widely available for sale from the following nurseries.